No. 33. Tsagain Myo [Sagaing]. Zayat. bl.uk > Online Gallery Home	> Online exhibitions	> Asia, Pacific and Africa Collections	> No. 33. Tsagain Myo [Sagaing]. Zayat. Photograph by Linnaeus Tripe of a zayat (an open-sided shelter for travellers) at Sagaing in Burma (Myanmar), from a portfolio of 120 prints. Tripe, an officer from the Madras Infantry, was the official photographer attached to a British diplomatic mission to King Mindon Min of Burma in 1855. This followed the British annexation of Pegu after the Second Anglo-Burmese War in 1852. Aside from official duties, the mission was instructed to gather information regarding the country and its people. 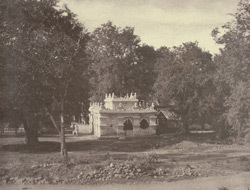 Tripe's architectural and topographical views are of great documentary importance as they are among the earliest surviving photographs of Burma. He wrote of this scene, 'Buildings of this kind are both for secular and religious purposes. They are resting places for travellers, refectories for votaries of the Temples near them, and in them the Pungyis or Priests [pongyis], deliver their homilies'. Sagaing became capital of an independent Shan kingdom in 1315, after the fall of Bagan (Pagan) had thrown Burma into chaos. After a few decades, the Shan king shifted to Ava (Inwa) and Sagaing then declined in political importance, only briefly reverting to the capital of the Burman Konbaung dynasty under King Naungdawgyi in the 1760s. It became known more as a religious centre, supporting thousands of monks and nuns. Today, people from all over the country come to Sagaing to meditate and it is known as 'Little Bagan' because of the multitudes of temples and monasteries here.